The Vancouver Police Department (VPD) is set for a showdown with Downtown Eastside (DTES) advocates at a Police Board meeting this afternoon, where cops aim to dismiss a complaint that they're targeting area residents with jaywalking and vending tickets. Pivot Legal Society filed a complaint with the Board last spring alleging the VPD discriminates against DTES residents by issuing a disproportionate number of bylaw tickets, The Province reported. Pivot alleged in a March news release that 1,448 street vending tickets were handed out in the DTES between 2008 and 2012 -- 95 per cent of the total in that time period -- compared with 28 tickets in the Downtown Core. The Society said in a later news release that 76 per cent of the city's jaywalking tickets and 31 per cent of panhandling tickets were handed out in the neighbourhood in the same time period. Pivot Legal told The Huffington Post B.C. the VPD later revised the DTES panhandling figures upwards to 41 per cent. 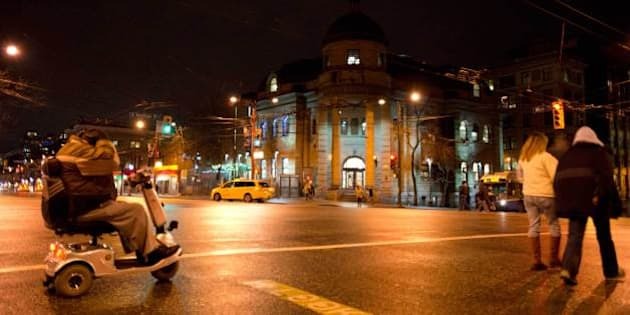 "When you are saying that for the entire three or four-year period, there is only been one or two tickets given out for jaywalking in Kerrisdale, that to me shows that not only there is enforcement on the Downtown Eastside, but that you are completely ignoring enforcement in other parts of the city," Pivot lawyer Doug King told Global News. The VPD is asking the police board to dismiss the complaint, saying that there are "more officers per capita in the DTES than any other neighbourhood in the city," the network reported. Police have also said that pedestrians have a 3,130-per-cent higher chance of being struck by cars in the DTES than elsewhere, The Province reported.